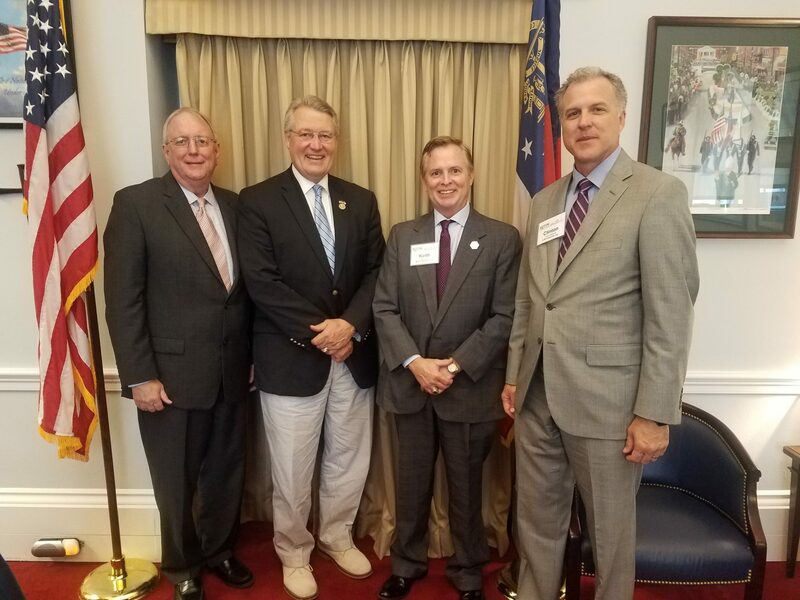 Dalton, GA – MFG Chemical, LLC, President and CEO Keith Arnold recently shared key insight about the importance of specialty chemicals and how the company positively impacts the community and economy during the Specialty Chemical Industry Fly-In, June 5-6, in Washington, DC. The Fly-In is an annual event of the Society of Chemical Manufacturers & Affiliates (SOCMA), a trade association that represents MFG Chemical and other specialty and fine chemical manufacturers. Arnold serves on the association’s Board of Governors. Among nine meetings on Capitol Hill, Arnold talked with legislative representatives from Georgia and Texas, including a visit with Representative Rick Allen (R-GA), where he shared the positive impact that business-friendly legislation and free trade has on MFG Chemical’s business. He also weighed in on many other key issues impacting the industry and encouraged continued dialogue with Congress to find legislative resolutions moving forward. MFG Chemical President and CEO Keith Arnold recently met Representative Rick Allen (R-GA) during SOCMA’s Specialty Chemical Industry Fly-In. From left are Gene Williams, President, Optima Chemical Group, LLC; Allen; Arnold; and Clinton Beeland, President and CEO, CJB Industries, Inc. The Society of Chemical Manufacturers & Affiliates (SOCMA) is part of a $300 billion industry that’s fueling the U.S. economy. Our members play an indispensable role in the global chemical supply chain, providing specialty chemicals to companies in markets ranging from aerospace and electronics to pharmaceuticals and agriculture. For more information, visit www.socma.com. MFG Chemical is a custom and toll manufacturer of specialty chemicals for a variety of industries including pulp & paper, paints & coatings, mining, oil field, agriculture, lube additives, and personal care. The company operates three manufacturing facilities in Northwest Georgia. For more information, visit www.mfgchemical.com.